“Back to the Future” is finally here. Lexus had released a video of their new magnetic suspension hoverboard. Inherently a frictionless skateboard, this machine of the future operates by magnetic tracks pre-laid in Barcelona. Smoother than ice skating but temperamental, the hoverboard still needs some work but is steps closer to a real-life science fiction movie than ever. 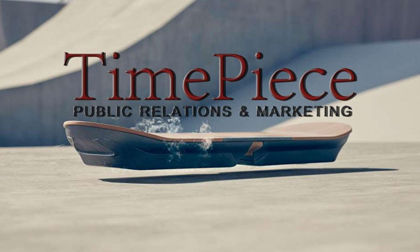 As hoverboard technology and PR techniques both improve with time and development, PR agencies aim for frictionless PR. One sure-fire way to accomplish this is by keeping up positive relationships with clients. Whether it’s sending out birthday and Christmas cards annually or simply maintaining a pleasant tone in emails and phone calls, clients are less likely to respond with negative feedback if you are making an effort to keep up tidy relations with them. Smooth-sailing PR also encompasses timely releases. From sending out news releases to replying quickly to emails, clients appreciate nothing more than a quick result to their requests. As a PR pro, you are at the beck and call to those you represent, and if you do so with timely responses complete with a smile, it’s icing on the cake and comes as close as you can get to glossy PR. At TimePiece PR & Marketing, we operate on a friction-free basis, ensuring that our clients receive on-time responses with a positive attitude. Positive client relationships are part of who we are and at the heart of frictionless public relations.